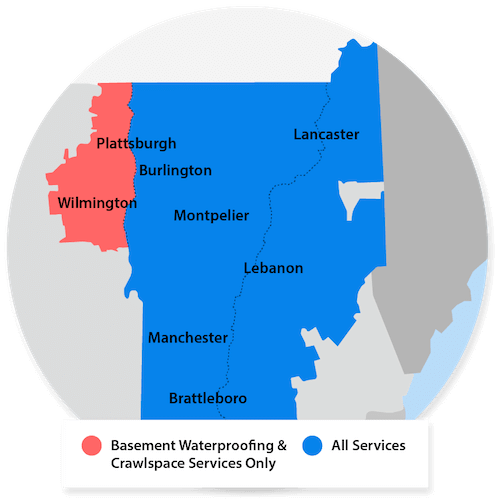 A family in Claremont, NH called us with concerns about their basement constantly flooding with every rain storm and thaw. We addressed the issue by installing our TripleSafe Sump Pump System to provide the family with a reliable system containing a primary pump, secondary pump and battery back-up system to prevent any future flooding. During the time of the sump pump installation, the customer also installed a new hot water system. Great transformation for their newly finished basement! A home in Lincoln, New Hampshire already had a working sump pump in their basement. The problem was the pump was very old and could not keep up with the amount of water entering the basement. The owners contacted Matt Clark's Northern Basement Systems for FREE ESTIMATE. One of Matt's System Design Specialist set them up with the perfect solution to their inefficient pump. Northern Basement Systems installed a TripleSafe Sump Pump with a discharge line and IceGuard. A basement in South Burlington, Vermont would get water anytime there was a good amount of rain. The homeowners got a free estimate form Matt Clark's Northern Basement Systems and then hired them to stop the water issue. Matt's team installed a SuperSump Plus sump pump to take all of the water out of the basement and an IceGuard Discharge Line System to take the pumped water away from the home. Water had created quite the mess in a basement in Milton, Vermont. A nice finished basement with carpet flooring became a basement with soaking wet carpet. The homeowner contacted Matt Clark's Northern Basement System with empahsis on doing whatever it takes to make sure it would never happen again. Matt Clark's Northern Basement Systems installed a Full Perimeter WaterGuard System, which will go around the perimeter of the basement and collect any water entering the basement. A TripleSafe Sump Pump was put in to take all of the water the WaterGuard collects and pumps it out of the basement down a outside discharge, away from the home. The owner of the home also decided to have a SaniDry Sedona dehumidifier installed to keep the humidity level in check. The basement is now completely dry and has a nice 55% humidity level. Before, this homeowner in Fairfax had a sump pump that was not performing as desired and causing problems. Northern Basement Systems installed a Super Sump pump, an interior discharge line, and an exterior, Ice guard into the preexisting pump's location. This new system is an effective and economical solution to keep their basement dry and prevent future basement flooding. Overall great improvement for these homeowners!